Steve, have you used the Behr paint over Jansens or Golden paint, or GAC700 or Jansens Cork Sealer? I use it over oils, other acrylics, and gessoes (white and black). 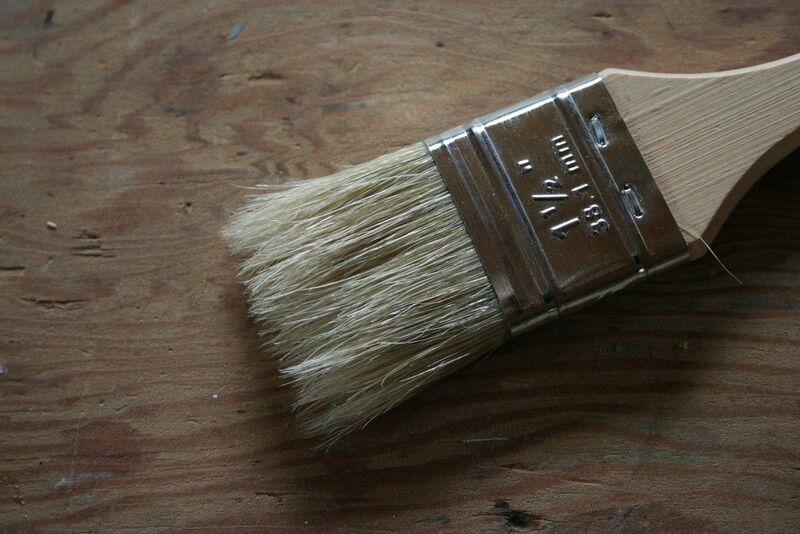 From my experience, acrylic almost always works well as a topcoat - but will never be as tough as oils. beautiful! 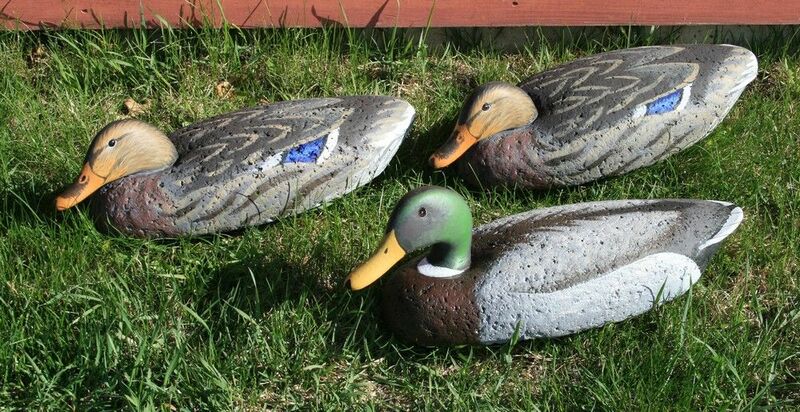 someday when i settle down and plant some roots I'd love to carve my own cork decoys. Ditto on the brush instructions - the birds look great! There is nothing fancy here. 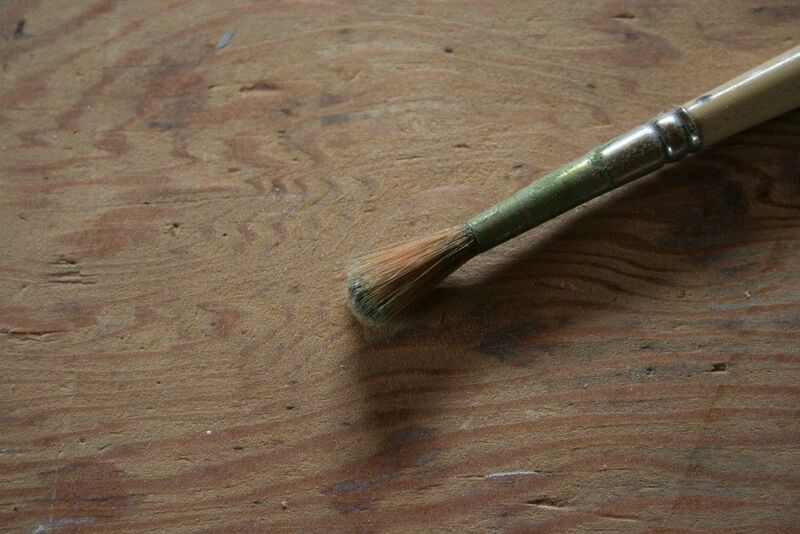 The "flats" below - square-tipped brushes with fairly stiff bristles do the bulk of the work. They allow me to both pull and push paint around (unlike the finer-bristled brushes I use on mantel-piece birds that I finish in tube oils). Also, one "rule" is to use the largest brush whenever you can. 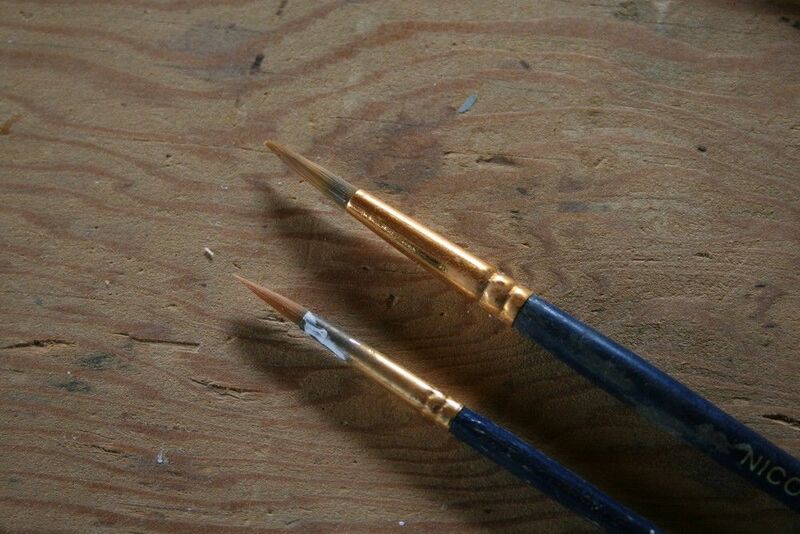 I use the "throw-away/chip" brush for sealing (spar varnish), priming (flat oils) and large areas of color. 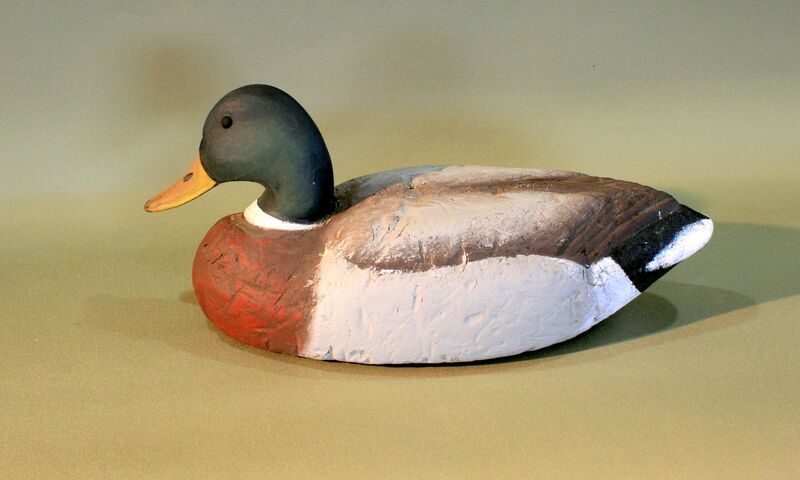 They are also good for stippling (which I only did a little bit on this rig - like the rump on the Hen Mallard). 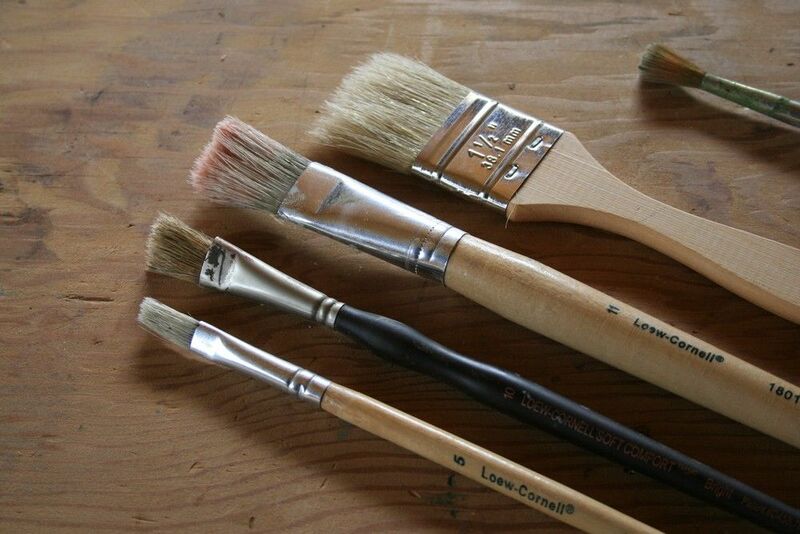 Especially for certain effects, these brushes can get more useful as they get worn and frayed. 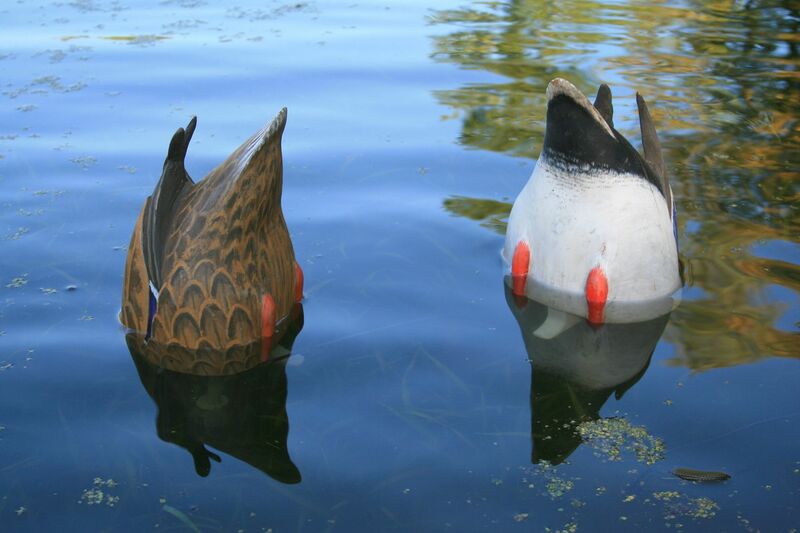 The pointed "rounds" were used for the flecking/streaking on the heads of the Blacks and Hen Mallards. Here using the largest brush that will hold a point allows me to complete a head with just a couple of brush loads of paint. The smaller one was used only for the lower eyelids. 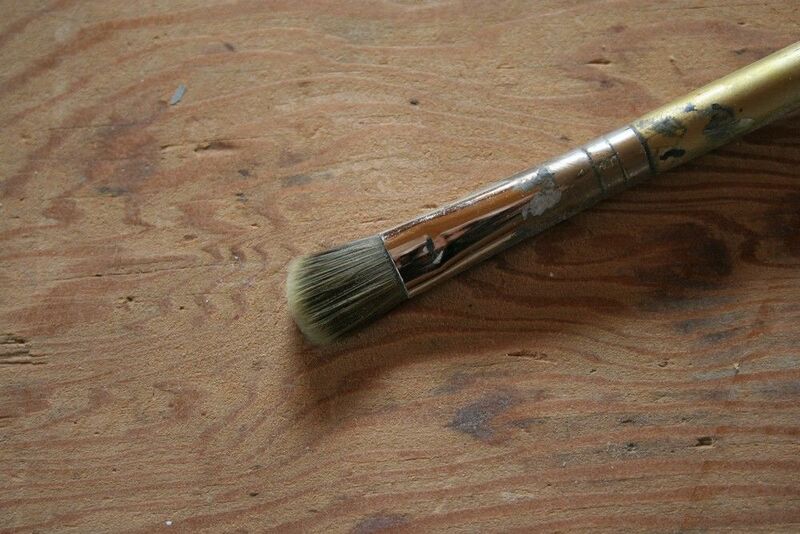 This older round has stiff and beat-up bristles - handy for stippling. I used it to add the highlights to the speculum on the Hen Mallards. Gotta go! Our season opens in an hour-and-a-half. Thanks - and good luck with the birds on the opener! 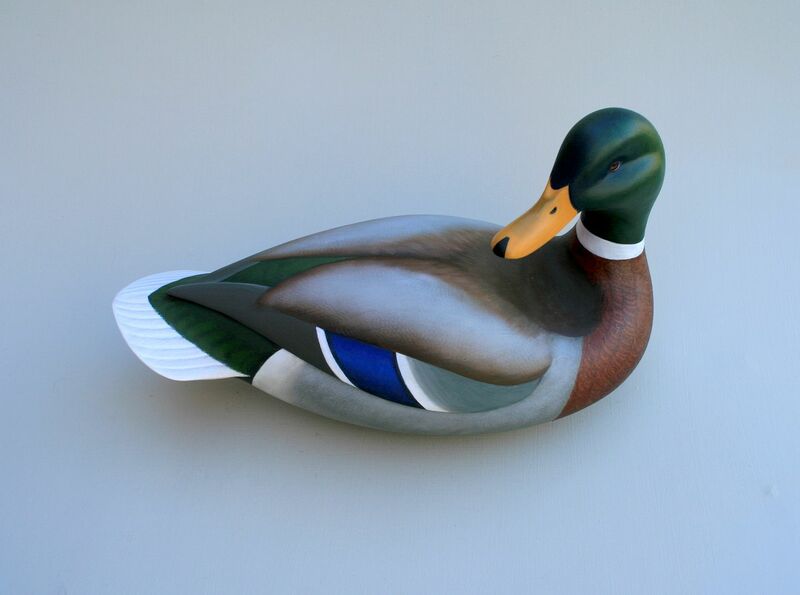 Hi Steve - great post and very helpful, especially to those of us with little knowledge or experience refinishing decoys. I am looking forward to rehabbing some coastal magnums. I just took a moment to view your website and now have it bookmarked. Love the story of the gunning box and I may try to get one at some point because it would provide a great hide when I can't gun the top of the tide for any reason. Your website does a great job of showing the many ways you have been involved in many aspects of waterfowling and a great source of information and inspiration. Really neat tutorial. Thanks for sharing! Capt.Mike Sanzone. F/V LAURA S.
Steve, nice refurbish, BUT, why no hen blacks in the bunch? Sorry - I neglected to use the photo that showed the sizes - #4 and #6. Even larger rounds are handy - as long as they hold a nice point, they can hold more paint. Short answer: Laziness. I MAY add the saddles on the bills to make half of them Hens - but most of my time is on building pilothouse right now. 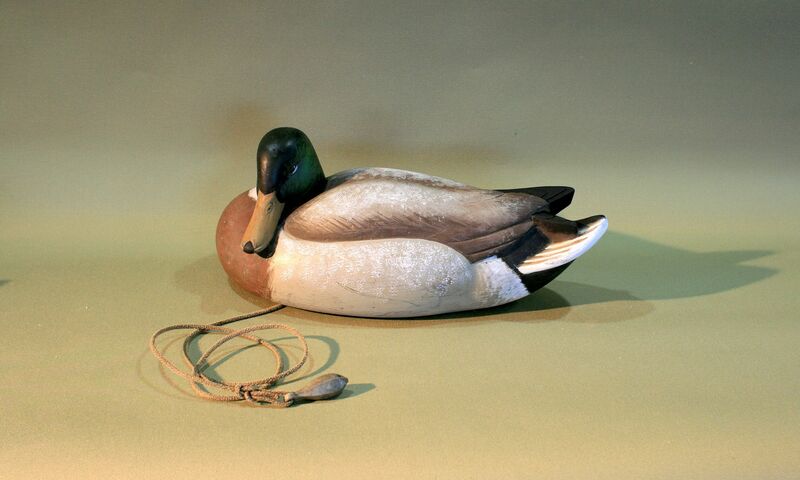 Both the decoys and the 'house should be delivered in less than 2 weeks. And, our Duck Season just opened on Saturday (with an exceptional hunt yesterday morning!). Steve, LOVE this thread. Doesn't look you have to fix any tails. Good thing, I have replaced many and it gets old...Love the paint job on the hens. 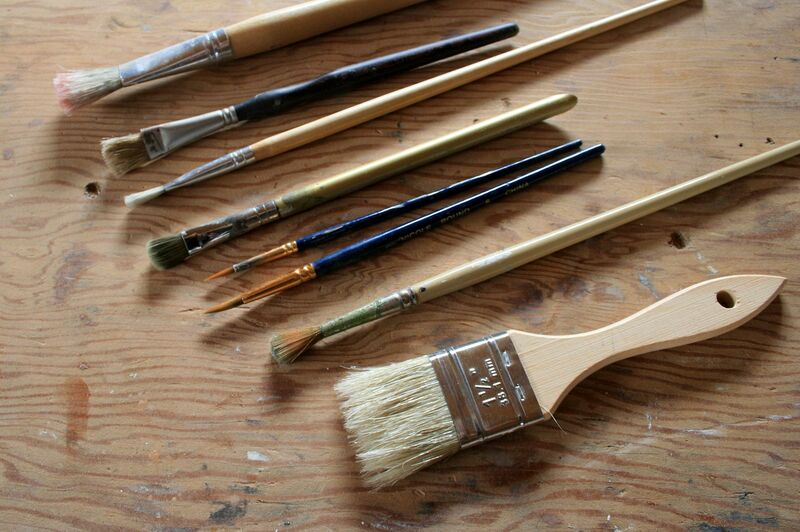 A quick question on painting over the dried varnish, do you rough the varnish up with sandpaper first? Duckboats, decoys and double barrels! I probably did - certainly if there were any sizable shiny patches of varnish. I usually hit it with 60 or 80 grit - because there's usually a few rough spots and "crumbs" - but it's just a few seconds per bird. Why do you add bondo rather that glue and cork dust? I do not use Bondo, per se - which is a polyester product. I use the epoxy and microballoons because it sticks really well AND - just as important - it sands very easily. The cork mixed with epoxy is a bit tougher to sand. Either approach is serviceable. You coming to the Duckboat Show? Thank You for sharing that pictorial. Fantastic! I just ran across your note from early April. I am glad you enjoyed my post. 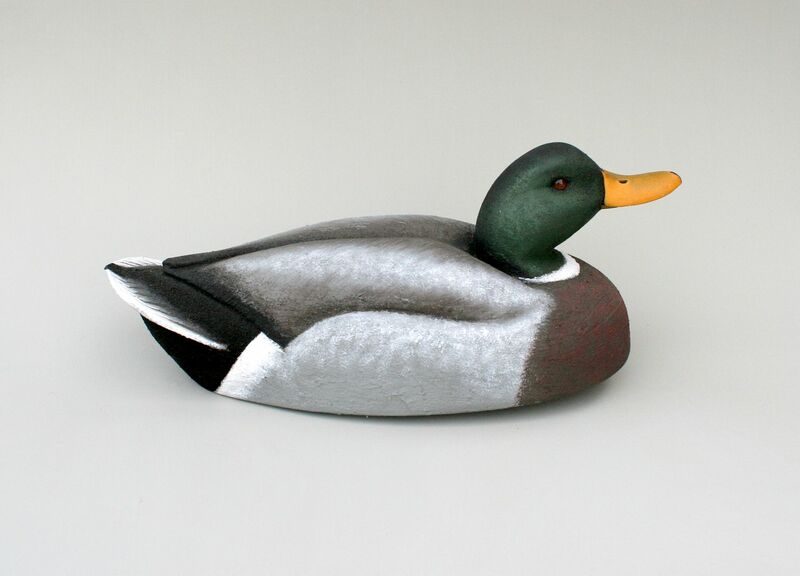 I understand your point about the white on the drake's flanks - my pattern on the Bean's decoy is simply my compromise to accommodate the shape of the body - which is both a bit too large for the head and certainly too wide aft. As you can see from my other birds, I try to get that encircling aspect when the shape allows. I carved these tip-ups circa 1980. Here are some other Bean's I re-painted last summer - tried to stretch the white a bit more astern. Finally - I hope you're still carving! I particularly like the reddish breasts on your hens in the last picture. A large number of suzies in my neck of the woods exhibit this coloration, but I seldom see it on decoys. Good eye, there!!!!!! I know you get lots of questions on this forum, so I apologize for adding one more, and did make a good faith search before posting this question, but, despite that, it seemed wise to ask is the list below still the recommended paint schedule for black duck decoys? If so, is one of those colors the choice for the body color, or is Lou's oil base FME the only way to go for that part of the bird? Thanks for any help. AND the best part, $1.94 per jar until 10/19. Are you kidding me? Including shipping. Are you kidding me? Delivered to your door.